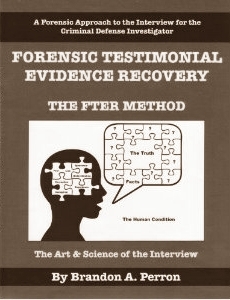 Some time ago, Dear Reader, you may recall my review of Investigative Interviewing by Eric Shepherd. What I didn't mention is that prior to purchasing that particular book, I had been searching for another that I had read a favourable review about but could neither remember the name of the author nor the title. I also couldn't locate the review again until quite recently, by complete chance, but now I have ordered both that particular book and its predecessor. 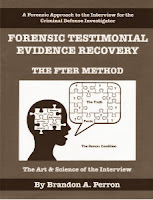 The name of the book is "Forensic Testimonial Evidence Recovery - The FTER Method" by Brandon A. Perron and you can read a very detailed review by Dean Beers at Pursuit Magazine. I have yet to receive this or the sister volume "Uncovering Reasonable Doubt - The Component Method" so am not posting a review, just a sort of heads-up on what I am intending to read in the near future. I am also interested in hearing what investigative books you may be reading and your thoughts on them be they good, bad, or indifferent. The books arrived in the morning's mail so reviews will be forthcoming soon.